I’m delighted to be able to announce that I now have a book bearing this title under contract with Cambridge University Press. It is part of a new series called Gatherings: short monographs on aspects of contemporary scholarly publishing. It should be published in 2019. In recent years, the edited collection of essays has undergone a crisis as a form of scholarly publishing. Without fanfare or particular crisis event, the perception spread that publishing in such collections was less prestigious than in journals; that such chapters were less visible to readers, and less acceptable to those assessing a scholar’s work; and that publishers were in retreat from such volumes. This volume sets out to explore the forms that the edited collection has taken in recent decades, the roots and shape of the present crisis (if it is indeed rightly so called), and the possible futures for the form. It focusses on the humanities, and history in particular, while drawing also on publishing trends in theology and in musicology. It is also focussed particularly on the UK, but in comparitive context with other nations, particularly the United States. Another review of my book on Michael Ramsey appears this week, this time from Keith Robbins in the English Historical Review. It is of course a pleasure to have a review from a senior scholar such as Professor Robbins, and in a leading generalist journal such as the EHR. Robbins concludes that it is a ‘well-balanced survey’, but otherwise has few substantive criticisms to make, positive or negative. The drawback [of the book’s thematic structure] is that it is difficult to form a sense of how, year on year, each of these topics related to each other in terms of Ramsey’s ordering of their importance and his attention. It is convenient for historians to write about ‘the state’ and ‘the nation’ in different chapters, but so many questions flow across boundaries that their separate treatment seems a little artificial. Most historians writing a book, I suspect, will have faced the choice between adopting either a chronological structure or a thematic one. My forthcoming book on Walter Hussey adopts a hybrid method: a broadly chronological structure, with some extended analyses of contextual themes interspersed. The adoption of either approach entails gains and losses, as Robbins states. With Hussey, the chronological structure works (I think) because the story has one track: a succession of commissions of works of art for his churches. In Ramsey’s case, there is no single narrative thread, but several that progress side by side during his time as archbishop. There are points of contact between them, to be sure, which both introduction and conclusion were intended to draw out, perhaps unsuccessfully. But year by year there is not the kind of clustering of attention that Robbins suggests there might be. Instead, there are multiple threads of political, ecumenical and legal development, each of which moves according to its own internal dynamics: fast and slow; some recently arisen and others of very long standing; bursts of activity and long pauses. If one were to order Ramsey’s career as a sequence of events, one would see legislative moves in Parliament, political events overseas, sessions of the Church Assembly, interactions with the media, meetings with the other churches, sometimes in the same week or indeed the same day. Ramsey seems to have been adept at putting disparate matters in their separate boxes in order that they might be dealt with on their own terms. But the day to day experience of the archbishop was one of a rapid succession of highly disparate matters. Sometimes Ramsey acted on his own initiative in response to events, such as the crises in Southern Rhodesia or Vietnam. In Parliament, sometimes he was able to initiate, and at other terms react, and to try to influence. The process of internal change in the Church is one of commissions, working groups, reports, and the to-and-fro between archbishop, bishops and the periodic deliberations of the Church Assembly or General Synod. Ecumenical change was necessarily a process of both initiative and reaction in relation to other churches at home and abroad. Part of the experience of being archbishop that I wanted to show was the imbalance between the power that he was supposed by many to wield, and the reality of the constraints under which he in fact operated. His power to initiate was considerable, but at the same time more limited than many thought. The structure of the book was an attempt to isolate some key themes in order that they might be analysed. It may well be possible to achieve the same analytic end in a more chronological way; but it would have required a better writer than me. More pragmatically, the structure of the book more closely serves the needs of most of the readers it may attract. As an author, one might fondly imagine that every reader will want to savour every page of the book, but the majority will come to it in search of material on a particular issue, as Robbins acknowledges. I had no wish to force those readers to work with the index to hew that material out. Some years ago (in 2010, I think) I gave an interview about the experience of doing a Ph.D., as part of an Institute of Historical Research project on the past and future of the history doctorate. For completeness, I make it available here. A little while ago I wrote a post about the future of the edited collection of essays. In that post, I suggested that there was still a future for the edited collection of essays in the humanities, but that in order to survive, those collections would need to become more coherent. But how might we understand and recognise coherence in a volume of this type ? That post was inspired by one particular volume in which I had a clear (if subjective) sense that the various contributors were in a continued dialogue with each other, of which the volume was a progress report. The traditional way in which scholars acknowledge intellectual contact with another is of course the footnote. And so I thought it would be interesting to take this same particular volume, and see whether my subjective sense of this internal dialogue was borne out. It took just a few minutes to go through the volume and record as a dataset each instance where an article cited another piece of work by one of the other contributors to the volume. 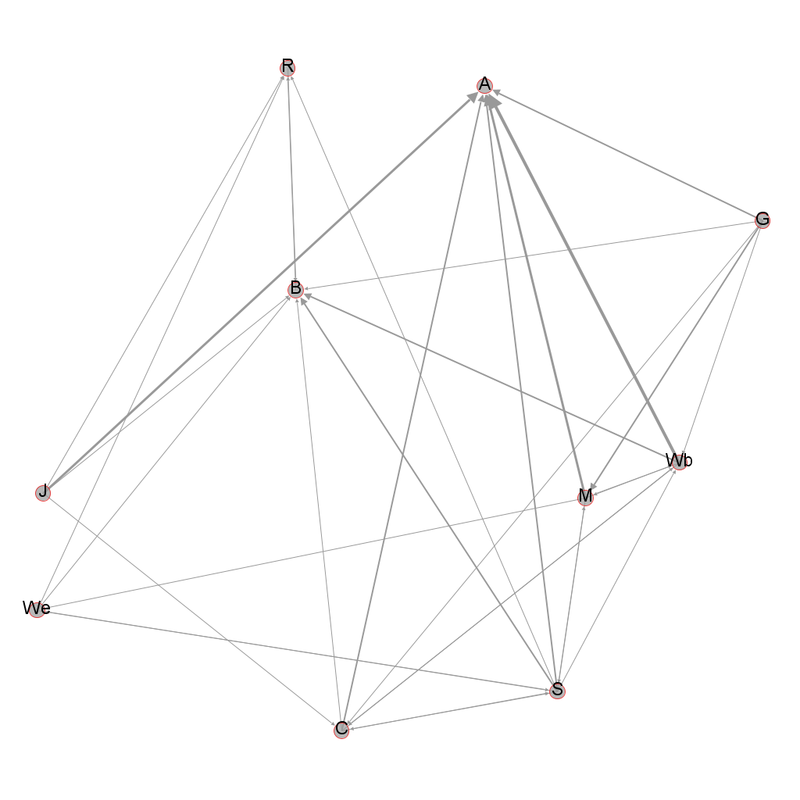 After some tentative first steps with Gephi I had some rough-and-ready network diagrams to illustrate the relationships. 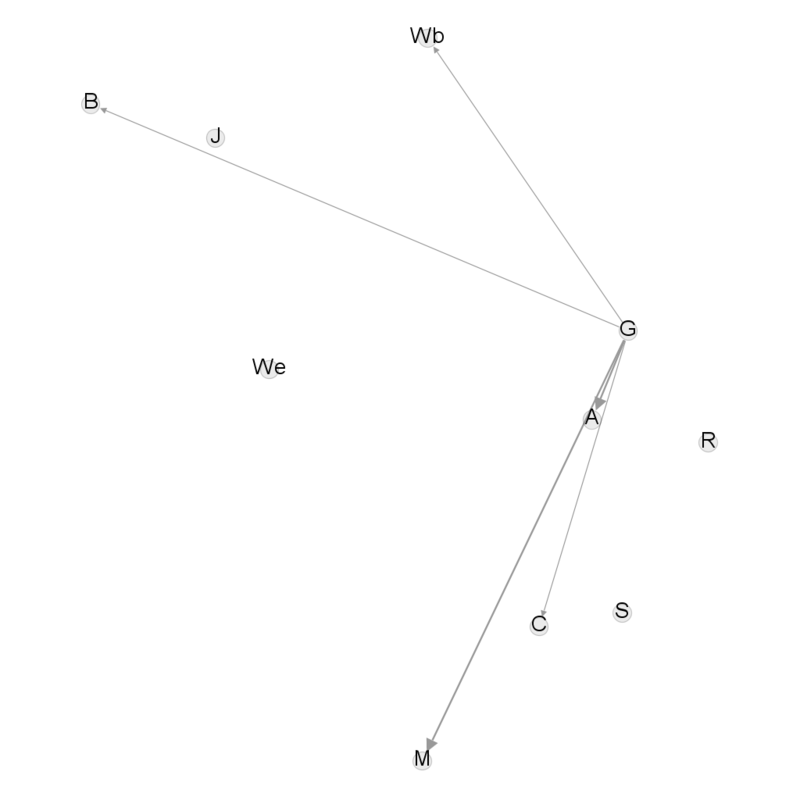 A pointed arrow indicates a citation from one author to another; a thicker line represents more works being cited; and an arrow at both ends indicates that the two authors cite each other. This first diagram shows the whole network, and immediately it is clear that all the authors here cite at least one work by one of the others, and in some cases several different works by several authors. In a later post, I shall be showing some diagrams of other collections which I think do not have the same internal dialogue. We can also begin to see some variations between the authors in terms of the attention they are being paid by the others; and this is shown clearly if we isolate the citations of works by A (top right) and B (bottom left). 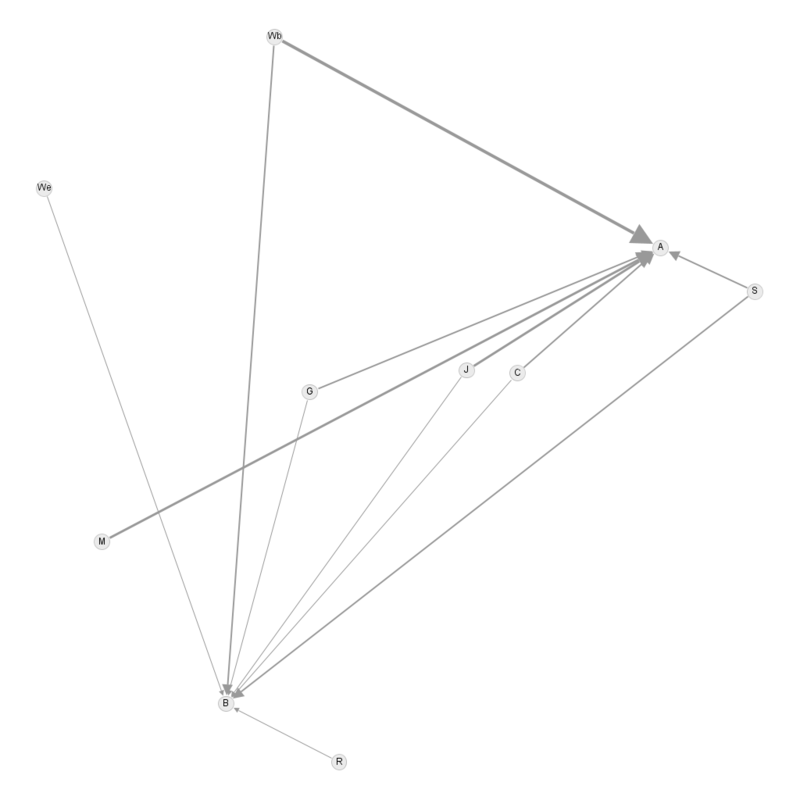 Authors A and B are clearly the most cited nodes in this particular network. This is explicable if we know that A is one of the two editors responsible for assembling the team of authors; and that A has also published a large number of individual articles in the field, which explains the thickness of some of the arrows, as authors cite more than one of A’s works. In contrast, B is cited by a similar number of the other authors, but not so many of B’s works each time. This chimes with the fact that B is the eminence grise of the field, but it is their definitive monograph on the topic that is being cited. 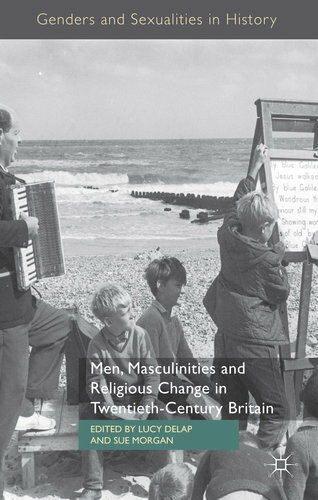 ‘with the strong impression that masculinity is one of the most neglected analytic lenses through which the history of British religion in the twentieth century should be viewed. Religious historians have long tended to concentrate on other fault lines: between denominations within individual faiths, particularly the Christian churches; and between each of the Christian churches and the secular, however it may be defined. In more recent years, a reckoning has been made with the effects of the post-war growth of the other world faiths; but this in itself has tended to focus on the interaction of the faith of these new arrivals from the Commonwealth and the Christianity of the receiving population, and with the secular state. […] even in the very recent debates about integration and ‘community relations’, the Muslim Other has been viewed as monolithic, rather than as a collection of communities of different ethnicities, geographic origins, genders and sexualities. ‘There has of course been significant work on the ‘muscular Christianity’ of the nineteenth century, such as that by Dominic Erdozain on sport, but this analysis has rarely been carried forward into the twentieth century. And where secularisation in the twentieth century has been analysed in gender terms, such as in the seminal work of Callum Brown, it has been about women, as home-makers, educators of children, carriers of culture. It also contains essays on Jewish, Buddhist, Muslim and Hindu themes, as well as an essay from Callum G. Brown on non-religion, which is yet to properly become a unit of analysis in its own right and not simply a residual category, of absence rather than presence. My main criticism of the volume was that some of the essays seem to document the activities of groups of religious men without fully getting to grips with those activities as intrinsically gendered in and of themselves. There was also more than one essay that lacked a clear distinction between ‘evangelical’, ‘fundamentalist’ and merely ‘Protestant’; overlapping but distinct categories often unhelpfully elided. Despite this, the volume is a good example of the best kind of edited collection, that amounts to more than the sum of its parts.